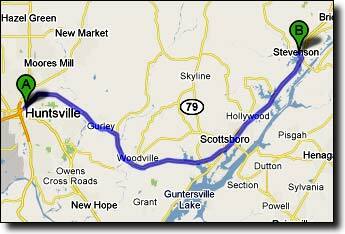 This scenic 69 mile route starts in Stevenson, Alabama, 60 miles east of Huntsville just off US-72. 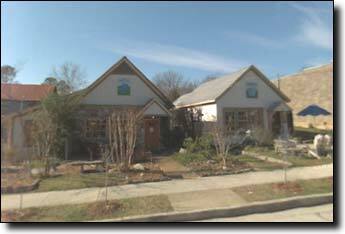 It travels up to Sewanee, Tennessee, home to the University of the South. The two main roads have smooth pavement with unusually light traffic and few turns. It's mostly uphill to Sewanee and generally downhill on the return. 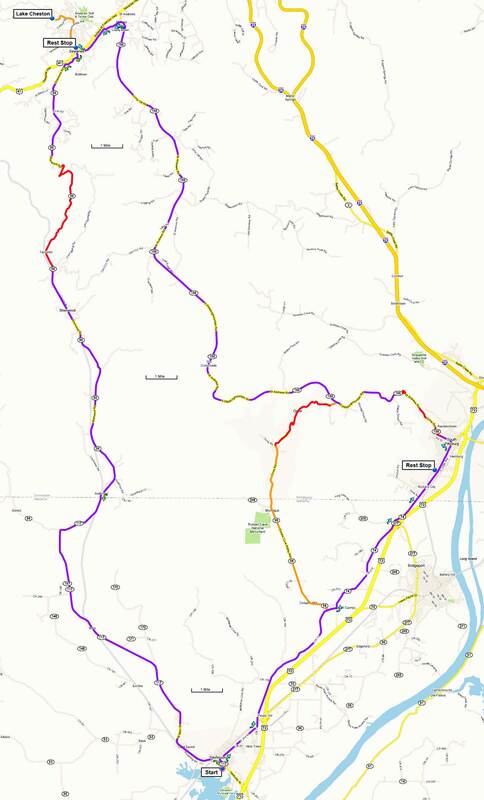 The route heads northeast toward South Pittsburg on rolling roads with some rough pavement. 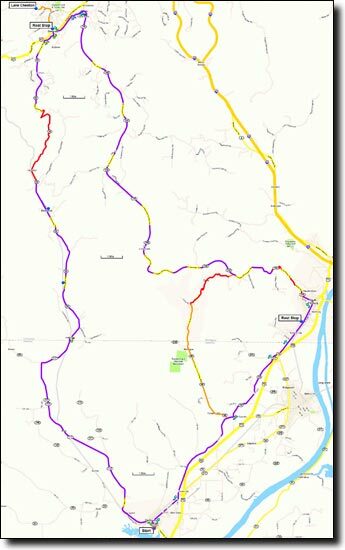 The climb out of South Pittsburg has a 9% average grade, fairly steady with trees shading most of it but there are a couple of steeper sections in the last half mile. Following the climb there are many long rollers that make for a good natural interval workout, improving your appetite for lunch. Near Sewanee the route takes a bike path on the south side of US-41 to avoid the high speed traffic and rumble strips. Sewanee is a college town so hours of operation change often. Phone numbers for the restaurants are on the cue sheet. 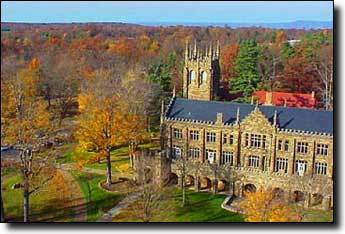 The university's campus is impressive, with several sandstone buildings including a cathedral. Lake Cheston is a worthwhile 2-mile side trip in the summer, a small swimming lake with shade and a small beach; bring a float and a towel. 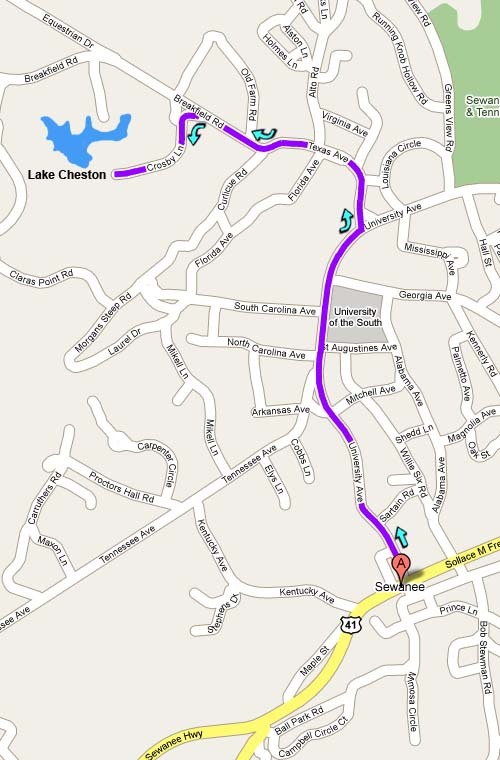 Directions to the lake, located on the far side of campus, are included on the cue sheet; here's a map. The return includes a long descent with a moderate grade that begins about four miles after leaving Sewanee, with two switchbacks near the top. After the descent it's mostly flat roads all the way back to Stevenson, scenic and quiet (allowing for good digestion). The total elevation gain is 2,370', starting at 610' with a maximum elevation of 1,980'. The ride starts at the Stevenson Middle School located in the town of Stevenson, Alabama. From Huntsville, Stevenson is about an hour's drive east on US-72. To exit from US-72 near Stevenson, bear right on the ramp off the highway and turn left/north onto AL-117. The school is located one mile north, on the left. The school is large and hard to miss, with parking in front.